Ar an seachtú lá is fiche d’Aibreán, bhí an deis ag seisear againn, ó Choiste an Chnoic, taisteal go Baile Átha Cliath in éineacht leis an Uasal Ó Ceallaigh, do Bhronnadh na nGaelbratach. Bhíomar an-bhródúil asainn an Ghaelbratach a bheith bainte amach again arís. Roinneamar bus leis an gColáiste agus shriocheamar Coláiste Phádraig thart ar a haon déag ar maidin. Bhí an t-ádh déarg linn toisc go raibh an ghrian ag scoilteadh na gcloch agus bhí an deis againn cúpla féiníní (selfies) a thógáil freisin. Ansin, bhuaileamar le Bláthnaid Ní Chofaigh, craoltóir de chuid RTÉ. Bhí píosa craic againn léi toisc go raibh suim aici in ár sciorta fada. Chomh maith leis sin, thógamar grúp phic i dteanna a chéile. Bhí anchuid scoileanna eile i láthair, idir bhunscoileanna agus mheánscoileanna. Bhí atmaisféar leictreach ann toisc go raibh gach mac máthair agus iníon athair ag caint is ag comhrá. Bhí banna ceoil ann freisin agus thosaigh gach duine ag damhsa agus ag canadh. Le linn a óráide, mhol Eoghan Mac Diarmada an obair chrua a chur na scoileanna go léir isteach leis an mbratach a bhaint amach agus d’impigh sé orainn leanúint ar aghaidh ag spreagadh na Gaeilge i measc ár scoileanna. Ansin, bhronn sé Gaelbhratach ar bheirt dalta ó gach scoil. 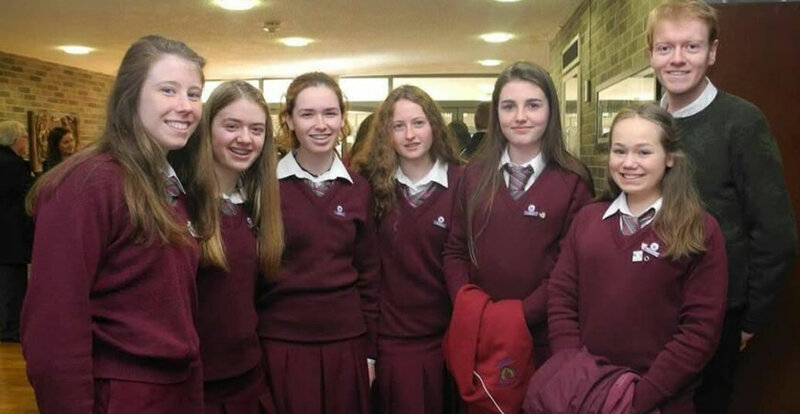 Chuaigh Aisling agus Megan suas ón gcoiste chun an Ghaelbhratach a fháil. Dúradh linn go mbeadh aoi speisialta ag an mbronnadh, ach ar an drochuair ní Ed Sheeran a bhí ann…! Ach cinnte, ba amhránaí den scoth í Sibéal Ní Chasaide. Ansin, chanamar amhrán bhFiann le chéile ag an deireadh. Tar éis an tsearmanais áille, chuaigh an coiste ag spaisteoireacht timpeall Bhaile Bhlainséir agus ansin rinnemar cinneadh bia a fháil. Shriocheamar Luimneach thart ar a sé a chlog, ar mhuin na muice ach tuirseach traochta, caite amach. Le Zoë Ní Mhuirris, Aoife Ní Mheadhra,Megan Nic an Tuile.